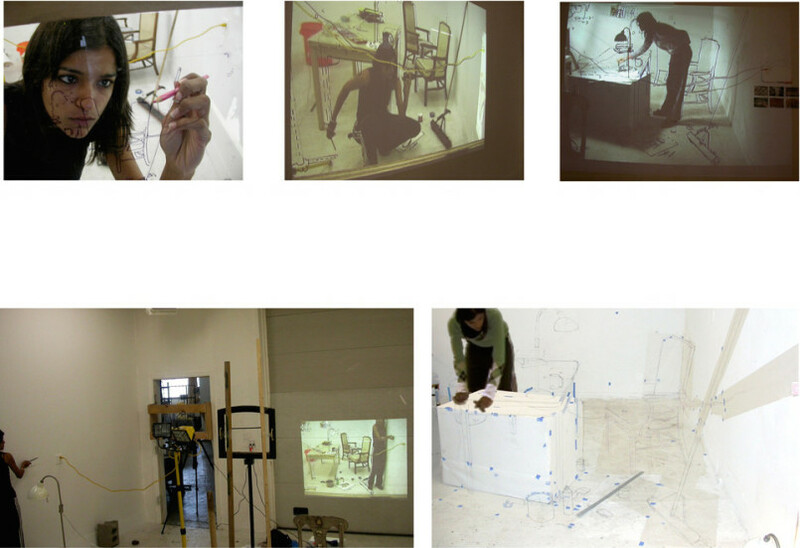 Video Stills of mapping process. A camera looks through the drawing of the illusory space on glass into the actual space with me in it. 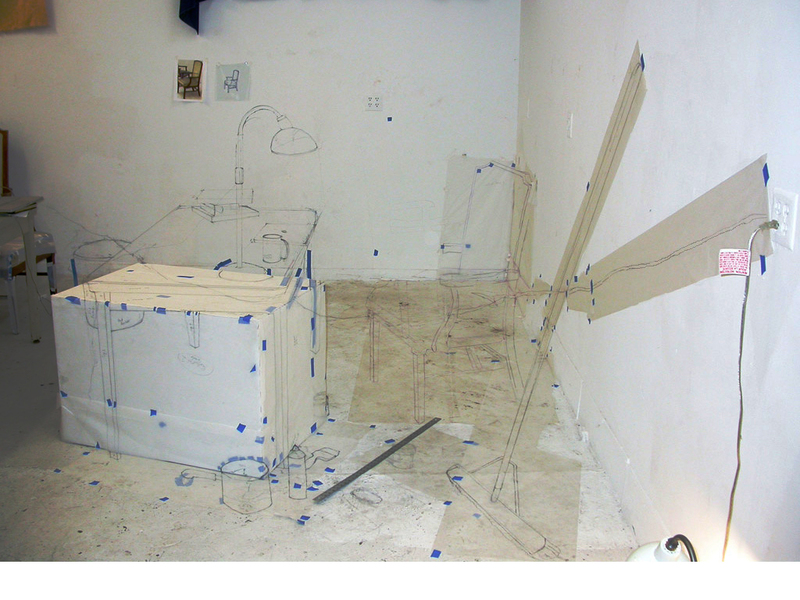 I awkwardly co-relate my drawings in 3d space to the image seen by the camera via an enlarged projection. 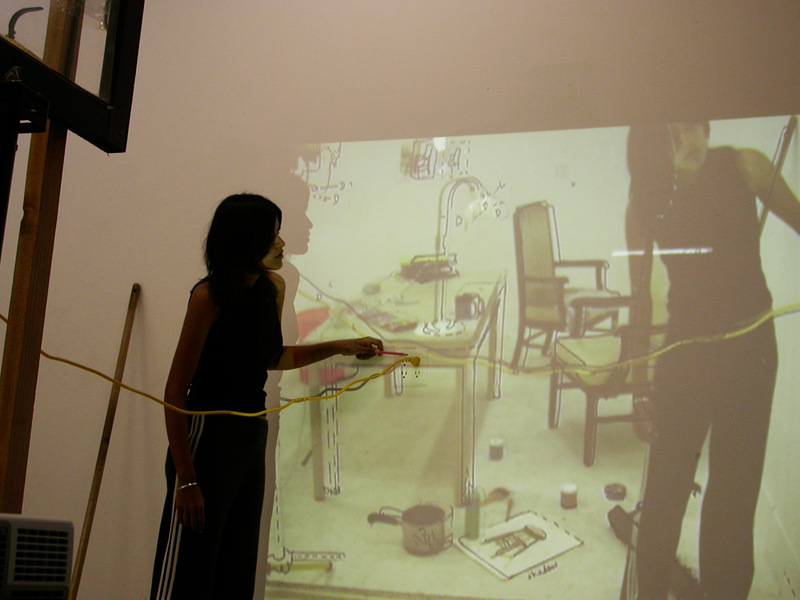 Mapping the studio, Sculpture Space, NY, 2008. Changing perceptions of the mapped chair. 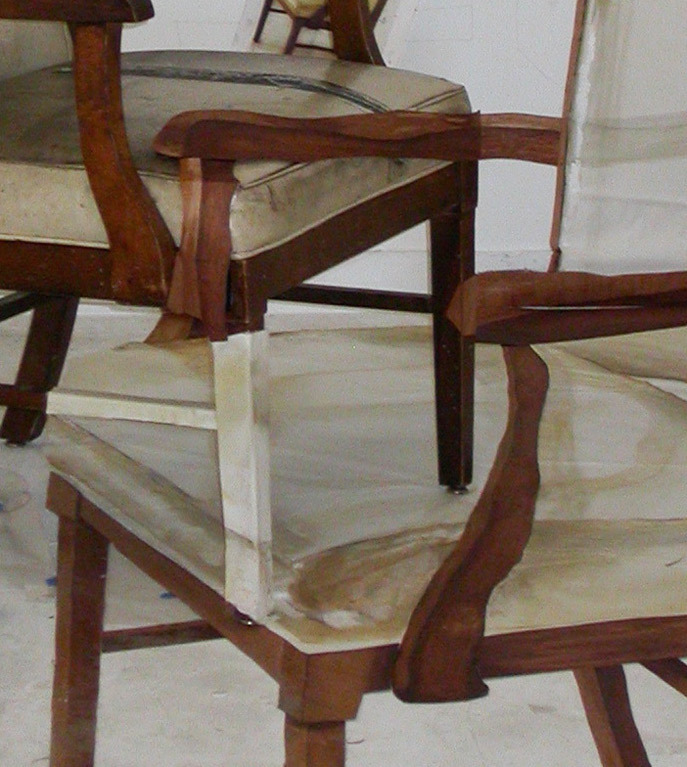 The chair is made of precisely cut and stained pieces of wood and vinyl. The pan is made of tined aluminum, copper foil and rubber. The remaining images are drawn in pencil and tape. 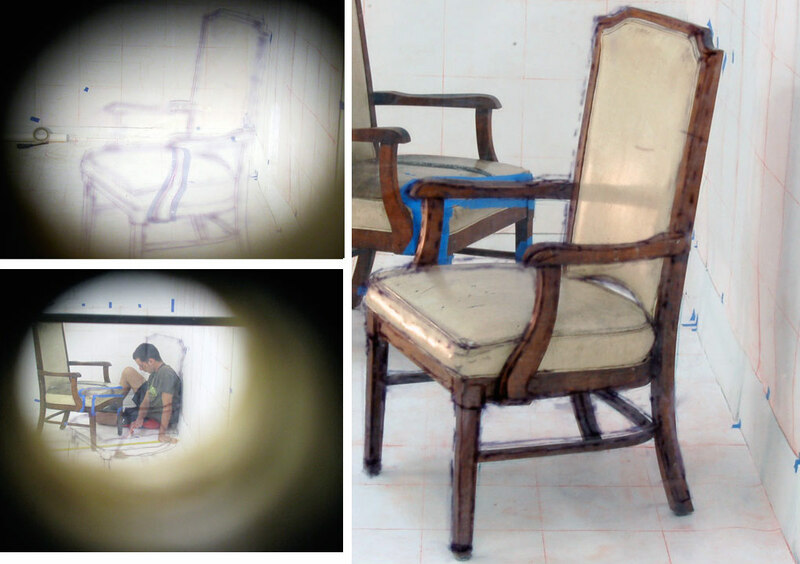 Detail – cut and stained wood and vinyl placed over compound curves of a real chair, on the wall behind and on the floor. Process details: Cutting, staining and placing wood. Partial drawing of chair displayed vertically. 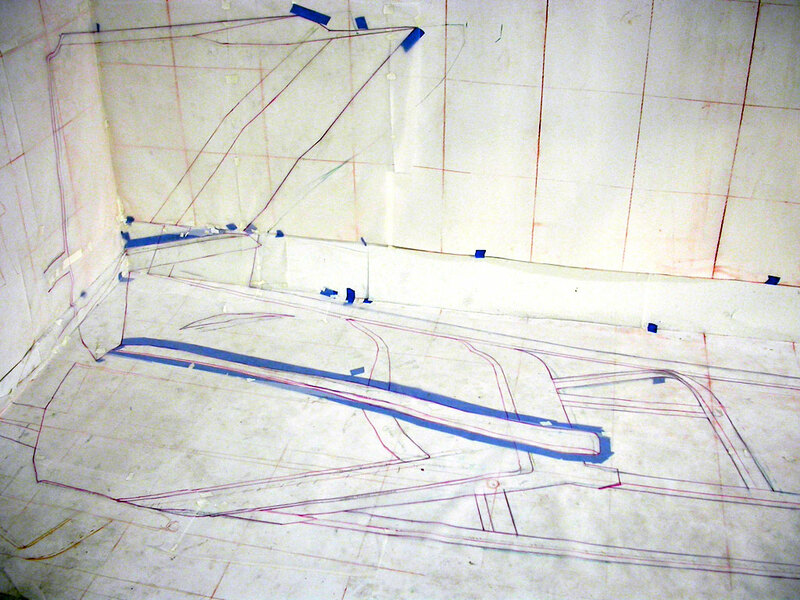 Drawing of chair in 3d space from alternate Vantage point. Video Still: Mapping the Studio. I awkwardly co-relate my drawings in 3d space to the image seen by the camera via an enlarged projection, thus mapping a version of perception that is not true to my current place in space-time. Project Description: This project involved drawing out and partly assembling an illusion of the studio space and its objects onto other pre-existing objects in the space. As viewers walk in, the objects begin to distort and break free into strange shapes stubbornly fighting the architecture and retaining the angles of a now-inaccurate perspective. 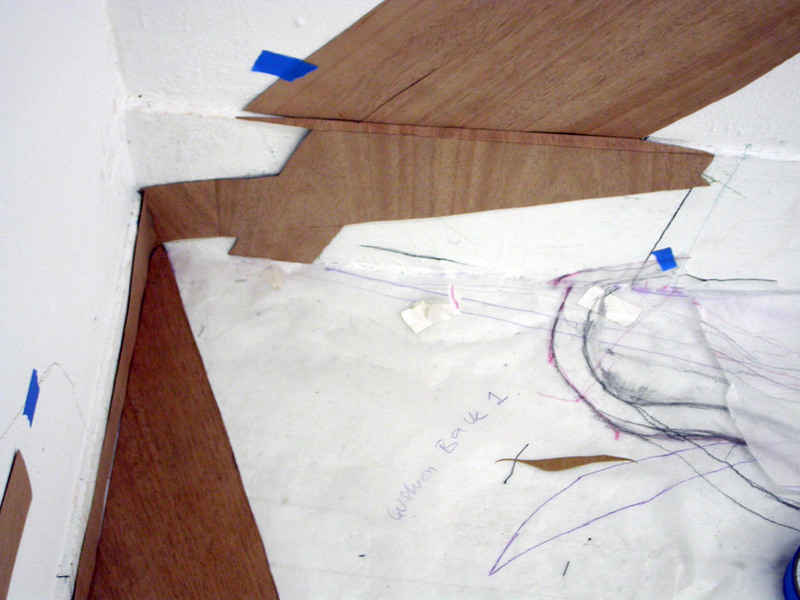 Mapping the Studio, Sculpture Space, Utica, NY, 2008. 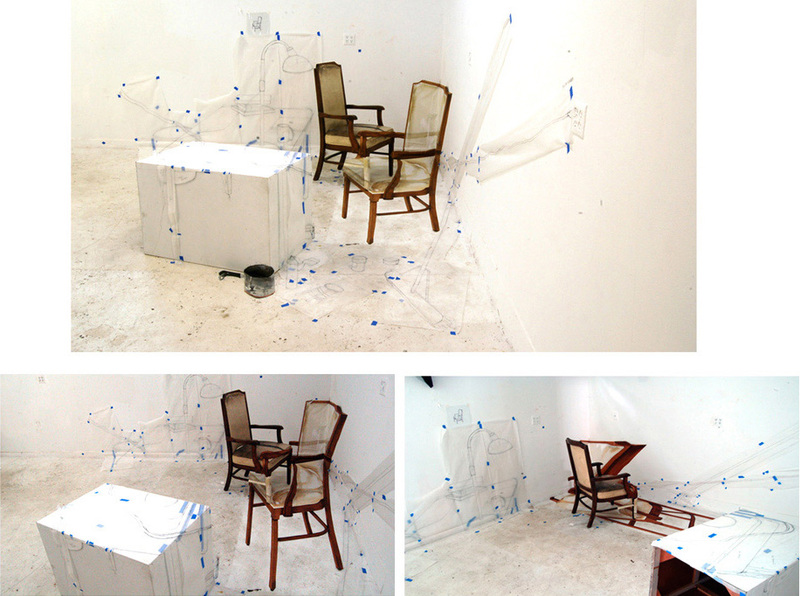 This project involved drawing out and partly assembling an illusion of the studio space and its objects onto other pre-existing objects in the space. 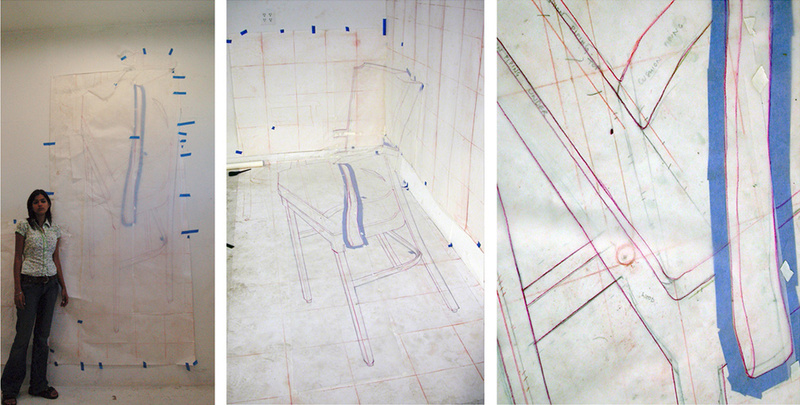 For example an illusion of a chair in the studio was created partly on the real chair, partly on 2 walls and the floor. As viewers walk in, the objects begin to distort and break free into strange shapes stubbornly fighting the architecture and retaining the angles of a now-inaccurate perspective. This creates a sort of space- time hiccup where we are free to move but our earlier perception is not. A video is generated during the creation of this fictional space around me. In the mapping process, a video camera looks through the drawing of the illusory space on glass into the actual space with me in it. 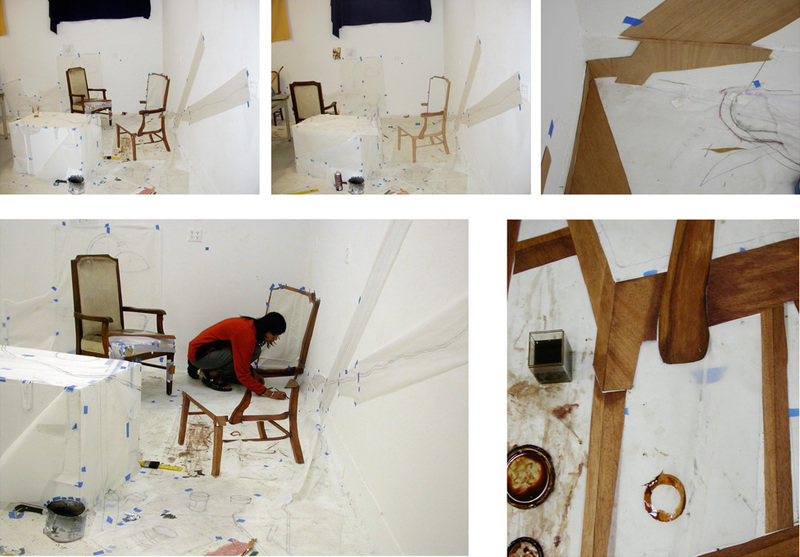 I co-relate my drawing on the floor, walls and other pre-existing furniture in the space to the image seen by the camera via an enlarged projection of it. I continually watch myself in the projection as I map out a version of perception that is not true to my current place in space-time (but I momentarily subscribe to) as attested by another video camera placed elsewhere revealing the absurdity of this one point view and my awkward attempts at trying to match it.